I’m not much of a lemon fan in food. In drinks, sure. Food? Eh. Don’t like Lemon squares, bars or pies. My desserts should be sweet, not tangy. Don’t like citrus in my salads. About the only place where it’s really ok is squirted on seafood or part of guacamole. Maybe as a flavor enhancer, but certainly not a main flavor. So, why do lemon chicken? One of my favorite cookbooks is Rao’s Cookbook: Over 100 Years of Italian Home Cooking. The recipes are amazingly simple and very good. If you have never heard of Rao’s, it’s a much sought after traditional Italian restaurant in New York City. Reservations are very prized. But, if you follow the cookbook, you can easily recreate the experience at home. One of their signature dishes is lemon chicken. I decided to be brave and try it. I’ve tried their lasagna and marinara to much success. I had really high hopes for this. First, some background. Broiling chicken is a bit of an art, but perfect for a quick weeknight dinner. It’s like indoor grilling. All of the heat is high and coming from a single point. On the downside, broiling is sort of messy and can cause the fire alarm to go off, many, many times. You also have to flip things over, to ensure meat reaches a safe temperature. Easier said than done. Also, the type of chicken you use is critical. There are actually chickens labeled “broiler chickens” — you want those. Roasting chickens are too big for this dish. Additionally, you have to keep the oven door a bit ajar when broiling, or your oven will cycle off because “temperature” has been reached. Note the bread knife handle on the side. Good times, no? Anyway, the rest is rather humdrum. Broil on one side, flip, broil on the other, quarter the chicken, cover with sauce and bake for another 3 minutes. One the whole, very impressive meal for a weeknight! As far as the history of this dish goes, I believe it must be a mid-20th century invention, as lemons weren’t really commercially grown in Florida too much before the 1950s. I found no mention of Lemon Chicken (or it’s Italian version Pollo al limone) in any of the historical (late 19th century) cookbooks I usually peruse. 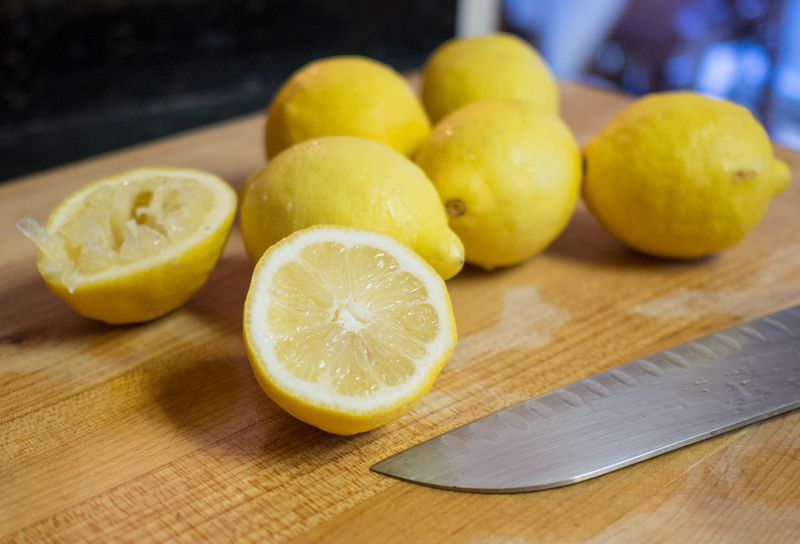 Additionally, this particular version uses an obscene about of lemon juice, 2 cups. I squeezed 6 of them, and it wasn’t a cup. Most of the classic recipes were very conservative with the high dollar items, so this seems like more of a dish that would evolve later in our food timeline. As mentioned above, this recipe is inspired by Rao’s Lemon Chicken Recipe I made some changes, however, as I didn’t think the original recipe had enough, I don’t know, something. This version was a bit more flavorful, in my estimation. Whisk together juice, zest, oil, vinegar, garlic, oregano, and salt and pepper. Cover and refrigerate until ready to use. Whisk or shake vigorously before using. 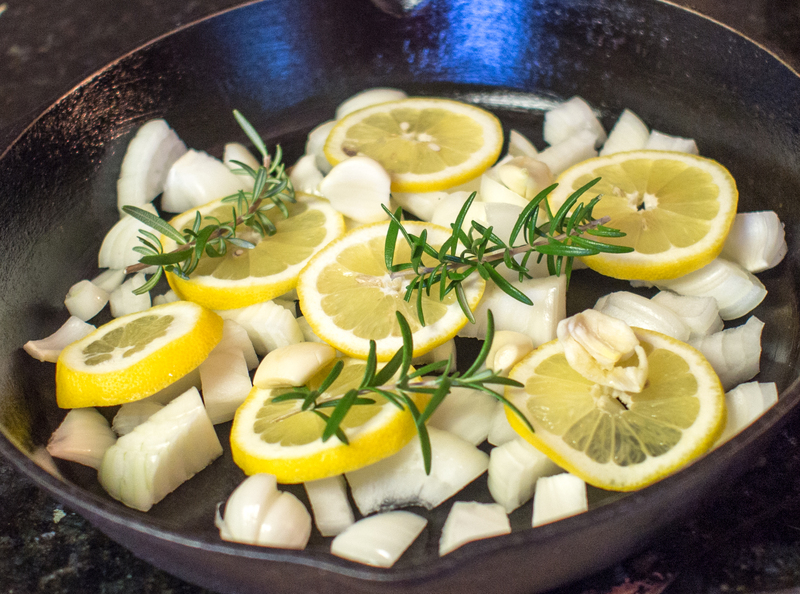 Place chicken on a cutting board and combine the olive oil, salt, pepper and granulated garlic. Rub olive oil mixture all over the poultry. Place onions, garlic, rosemary and lemons on the bottom of a baking pan (I used a cast iron skillet) and place chicken on top. Broil chicken, turning once, for about 30 minutes or until skin is golden-brown and juices run clear when bird is pierced with a fork. Remove chicken from broiler, leaving broiler on. 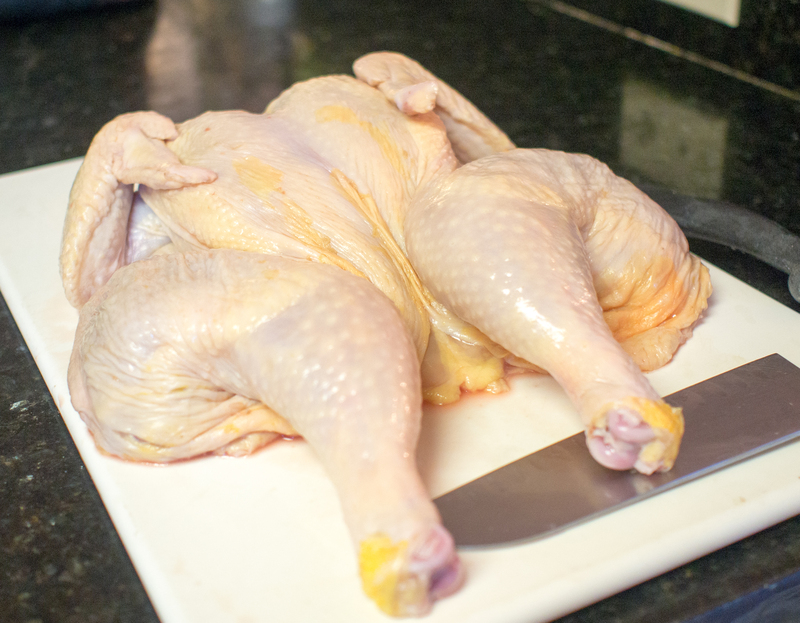 Using a very sharp knife, cut chicken into it’s typical serving pieces (leg, thigh, wings, and breast portions). 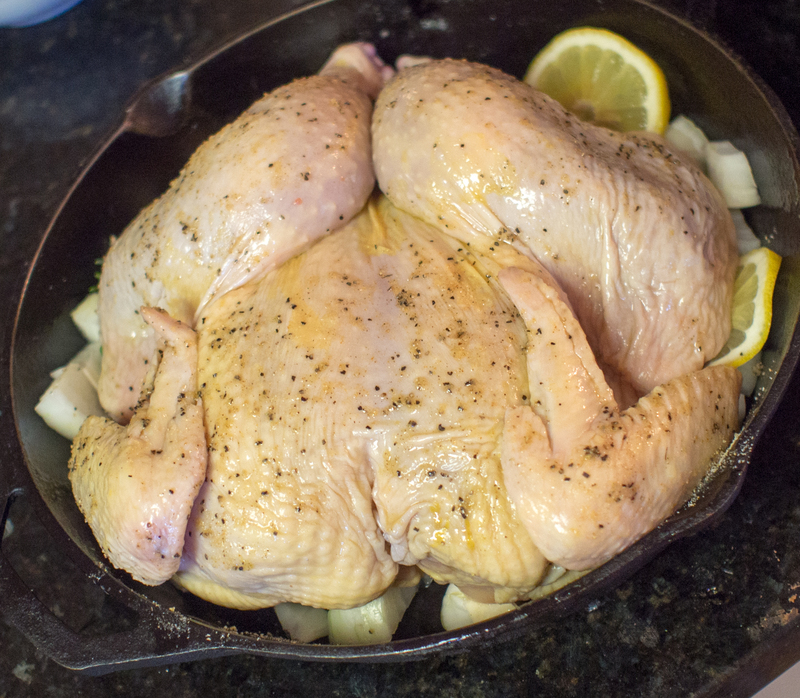 Place chicken on a baking sheet (that will fit in the broiler) with sides. 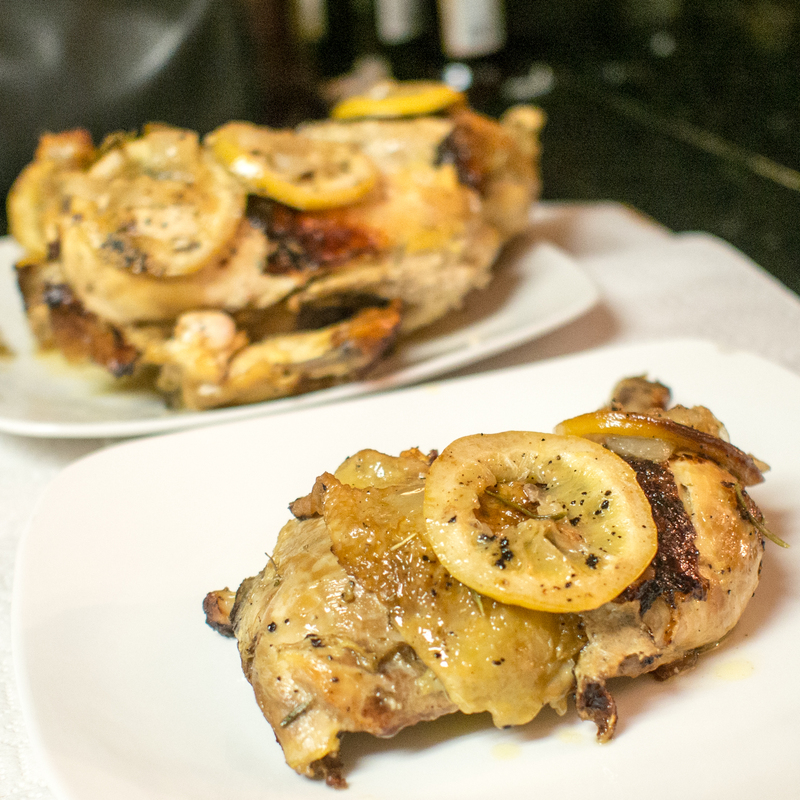 Pour half of the lemon sauce over the chicken and toss to coat well. If necessary, do this in 2 batches. Return chicken to broiler and broil for 3 minutes. Turn each piece and broil for an additional minute. Remove from broiler and portion the chicken onto each of 6 warm serving plates. While chicken is baking, slightly warm the remaining lemon sauce. Pour an equal amount of sauce over each chicken piece and serve with lots of crusty bread to absorb the sauce. This entry was posted in Low(er) Carb, Poultry and tagged Broil, Chicken, easy, Lemon chicken, poultry, Rao's, Rao's Lemon Chicken, weeknight on July 31, 2013 by dawn of food.